AT&T has just announced that the iPhone 4 is back-ordered until June 29, so if you didn’t pre-order and were planning on standing in line at your local AT&T store this Thursday in the hopes of snagging an iPhone 4, you’ll have to find a different outlet (unless their availability is also impacted). Other outlets include the Apple Store, Walmart, Best Buy and Radio Shack. 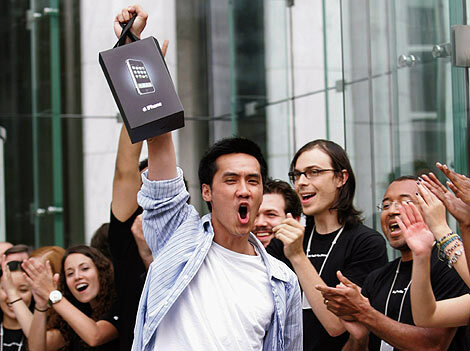 Preordered for home or business delivery: iPhone 4 will begin arriving this week for customers who preordered. We’ll send an email when each order has shipped. Retail purchase (no preorder): AT&T plans to have iPhone 4 inventory – available on a first-come, first-served basis while supplies last – on June 29 in its retail locations, at www.att.com , and in business sales channels. As inventory sells out, AT&T will offer the convenient option of purchasing iPhone 4 and having it delivered to a home or business or an AT&T store. As always, customers will receive an email once their order is placed, and again when it ships. To help customers stay up to date on iPhone 4 activities and important information, AT&T will post a series of videos beginning early this week at www.facebook.com/att . The videos will be informative and packed with customer-friendly tips and instructions around order fulfillment, iPhone 4 activation, inventory and – importantly – the new MicroSIM unique to iPhone 4 devices.